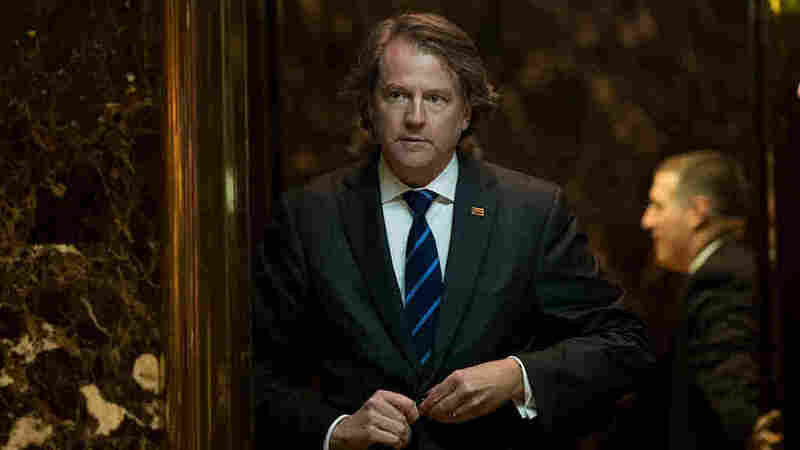 Trump Picks Longtime Washington Lawyer As His White House Counsel Unlike many people in Trump's inner circle, Donald McGahn has deep roots in the nation's capital. He led the Federal Election Commission and worked for the National Republican Congressional Committee. Donald McGahn, general counsel for the Trump transition team, gets into an elevator in the lobby at Trump Tower last week. On Friday, President-elect Trump announced McGahn would be his White House counsel. President-elect Donald Trump has chosen Donald McGahn, a longtime Washington lawyer who once led the Federal Election Commission, to be his White House counsel, his transition team announced Friday. "Don has a brilliant legal mind, excellent character and a deep understanding of constitutional law," Trump said in a statement, referring to the lawyer who served as both his campaign and transition attorney. "He will play a critical role in our administration, and I am grateful that he is willing to serve our country at such a high-level capacity." McGahn said he was "honored to continue advising President-elect Trump in the Trump-Pence Administration. President-elect Trump is a bold leader committed to draining the swamp in Washington and restoring economic prosperity and security. I look forward to serving the American public in this role." McGahn is a partner at the Jones Day law firm in Washington, where he has long represented candidates and elected officials. Unlike many people in Trump's inner circle, McGahn has deep roots in the nation's capital. He served as the top lawyer for the National Republican Congressional Committee and led the FEC, where he helped usher in looser regulations for campaign spending. McGahn's law firm biography reports he focused on building "due process" into elections enforcement over five years at the FEC. But his critics argue that mostly made it harder to bring enforcement actions against candidates or political action committees that failed to follow the rules. Like his most famous client, the president-elect, McGahn embraces the role of disrupter, telling the Center for Public Integrity that he served on the FEC "to change how the place thinks." The Wall Street Journal concluded that McGahn "marches to his own tune," highlighting his off-hours work as lead guitarist for a band that plays Guns N' Roses cover songs and other music. Trump has long been familiar with the McGahn family. McGahn's uncle, Patrick, another lawyer, helped the Trump family navigate real estate and political challenges for Trump's properties in Atlantic City, N.J.
McGahn's wife is a staffer on the House Financial Services Committee and a onetime spokeswoman for former Rep. Tom Delay, R-Texas. McGahn advised DeLay on a number of ethics controversies.